We are past the mid-way point of 2013 and the action from within New Mexico or featuring New Mexico fighters has been incredible. Our state has hosted several events including Bellator MMA back in February, Triple-A-MMA in April and a recent King of the Cage event in downtown Albuquerque. We have had fighters compete in several regional promotions as well as nationally in the UFC and Invicta FC. They have also gotten to travel from Juarez to Japan for high profile fights. Titles have been won, top contendership awarded and prospect ladders have been climbed during the course of the first six months of the year. To commemorate the half-year that was, SWFight.com compiled a list of “Half Year Awards” to put into perspective the best individual accomplishments as well as a few team accolades to go along with it. This is an easy call as Andres Quintana has not only been busy this year with three professional fights, but has also been perfect. Starting with a Bellator 91 bout that SWFight.com proclaimed “Fight of the Night”, Quintana has finished all three of his opponents with strikes. The “Bullet” defeated Russell Wilson, Brian Castillo and Cody Huard in succession. The Castillo and Huard fights came in a two week span and all three opponents succumbed to the pressure of Quintana’s striking acumen and knees from close range. 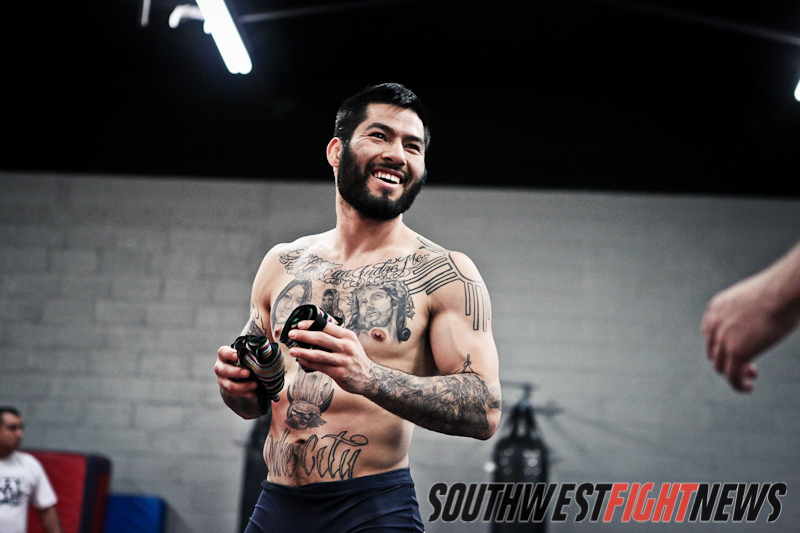 From a record 3-1 to 6-1 in a three month span, Quintana made his presence felt in the states regional scene and took his status from New Mexico fighter to one of New Mexico’s top prospects. 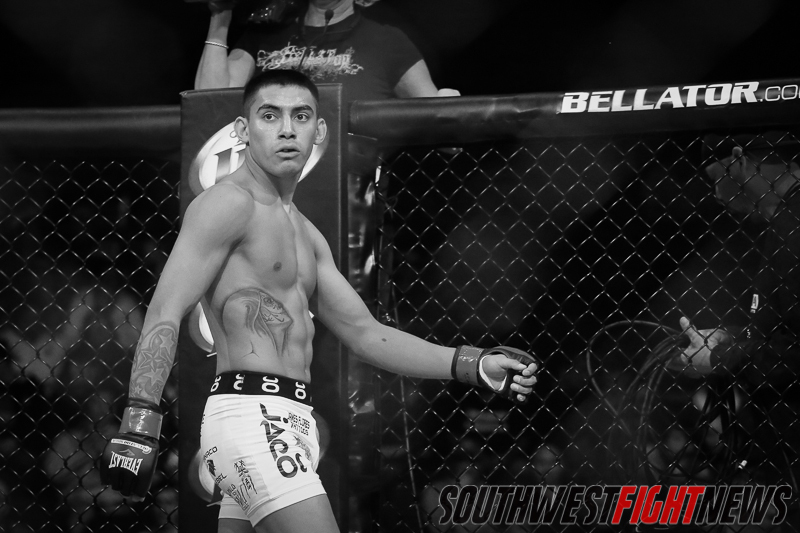 Most fight fans following the undercard of Bellator 91 and of Judgement MMA’s Adrian Cruz, may have thought if Cruz would be victorious over Gonzales it would be by decision or due to the powerful striking of the undefeated bantamweight fighter. Gonzales on paper had the more reputable Jiu Jitsu and while Cruz had a wrestling background, his strength had always been in the form of his top position dominance with ground and pound. It was no surprise to see Cruz control the pace in the first frame of the fight, but the second round is where a lot of fans watching from their computers and from the arena seats became frenzied over Cruz and his grappling prowess. After a slick trip from the cling along the cage, Cruz would land into side control and immediately isolate an arm on the grounded Gonzales. From there, Cruz went for a maneuver traditionally only seen in Gi-based Jiu Jitsu. Getting into the scarf hold position where one sits perpendicular to their opponent in side control, Cruz trapped an arm between his legs and with his arms cranking the neck, pushed the hips up applying extreme pressure to the elbow area. While the submission doesn’t have a definitive name, it can be labeled as a neck crank and scarf-hold armlock, with the armlock being the reason for submission. After losing two of the first three rounds in her Atomweight Title fight at Invicta 5, Jackson-Winklejohn’s Michelle “The Karate Hottie” Waterson would put a finishing stamp on what is one of the best WMMA fights of all time. Jessica Penne gave Waterson all she could handle as she nearly finished Waterson with an armbar in round 3 and Waterson pushed Penne to her limits as she in fact did finish an armbar attempt in round 4. With the win, Waterson brought home the most prestigious WMMA title back to New Mexico and became the states first major WMMA champion. The submission capped off an already brilliant fight that was back and forth from the opening bell and made for one amazing highlight reel for the Invicta FC promotion. Nobody should ever argue Damacio Page’s ability to knockout anyone on any given night and recent foe Patrick Ybarra knows that better then anybody. Page and Ybarra were on two opposite career trajectories heading into the Legacy event on May 31st. Ybarra was undefeated and considered one of the better prospects from Texas and Page was released from the UFC after a four fight losing streak dating back to 2010. Nearly two minutes into the round, Page found his range while Ybarra was caught inside the range of the “Angel of Death” and caught a looping right hook to the temple that quickly put Ybarra down to the mat. Out before he hit the mat, Page didn’t need to follow up with ground and pound and the referee stepped in to halt the bout. A one punch knockout for Page in a fight where he desperately needed a win to start his career resurgence. There is no doubt that the UFC is the premier promotion for mixed martial arts and the Jackson-Winklejohn gym has plenty to boast about from within the UFC ranks. This year the UFC started their own divisional ranking system and the lists just legitimize the elite caliber talent that our rich cultured state possesses. Jon Jones tops the list as the Champion of the Light-Heavyweight division and #2 ranked Pound-For-Pound fighter. As the promotions premier talent, Jones is joined by a whole slew of teammates splashed all around the company’s nine divisions. Flyweight John Dodson stands as the #2 Flyweight and fought for the title in a hotly contested fight with Champion Demetrious Johnson this year. Cub Swanson (#5) and Clay Guida (#8) are knocking on the door of title contendership at Featherweight with Swanson fighting Dennis Siver (#6) in what could spell title shot for Swanson with an impressive win. Despite a loss to Anthony Pettis (#2), Donald Cerrone (#6) is a mainstay atop the upper ranks of the Lightweights. With several quality wins, Cerrone is always found near the line between contender and top contender. The same can be said for Welterweight Carlos Condit (#2) as he is staring at a two-fight skid but losses coming against the Champion and Top Contender. Julie Kedzie (#8) and Travis Browne (#9) are still on the outside looking in for a title campaign but with the Women’s Bantamweight and Men’s Heavyweight divisions being slightly shallower then the rest, both Kedzie and Browne are a quality win away from jumping into the top-5 of their respective divisions. Fighters not ranked but still amongst the premier talents in the UFC are Erik Perez, Diego Brandao, Derek Brunson, Rustam Khabilov and Tom Watson.